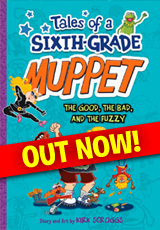 I’m pleased to announce that the Tales of a Sixth-Grade Muppet agony, er uh, saga continues with The Good, The Bad, and The Fuzzy. Join Danvers Blickensderfer, Kermit, Piggy, Fozzie, The Great Gonzo, and Robo-Beaker in a twisted tale of tweeny bopper tunage, big bully thugs, ghostly campfire stories involving giant chickens, runaway riverboats, poison ivy itch cream, and all your favorite summer camp shenanigans. Get your copy today! Right now! Get going!